Let’s say it now: there is no way last week’s victory can be topped. None. For the resurgent Miami Hurricanes looking to climb back into the ACC Coastal race, that’s just fine. Despite it being just one game, “The Return,” the “Miami Miracle,” whatever you choose to call it, has the Hurricanes riding a high that they have not experienced for years. It’s time to get back to business though, as the University of Virginia Cavaliers are heading to Sun Life Stadium this Homecoming weekend. The Cavaliers bring a 3-5 record into Saturday’s matchup, but that may be a bit misleading considering their difficult schedule thus far. All five of Virginia’s losses have been against teams with at least six wins already, and besides the loss to Boise State, every game has been competitive to the end. With that said and with all the talk of last week’s game still buzzing around Coral Gables, the Hurricanes (5-3, 2-2) could risk falling into the vaunted “trap game.” The Canes could be unwittingly looking ahead past the Cavaliers to a vital Coastal matchup at North Carolina that looms next week. Luckily for Larry Scott’s team, starting quarterback Brad Kaaya returned to practice earlier this week and has a chance to play on Saturday. 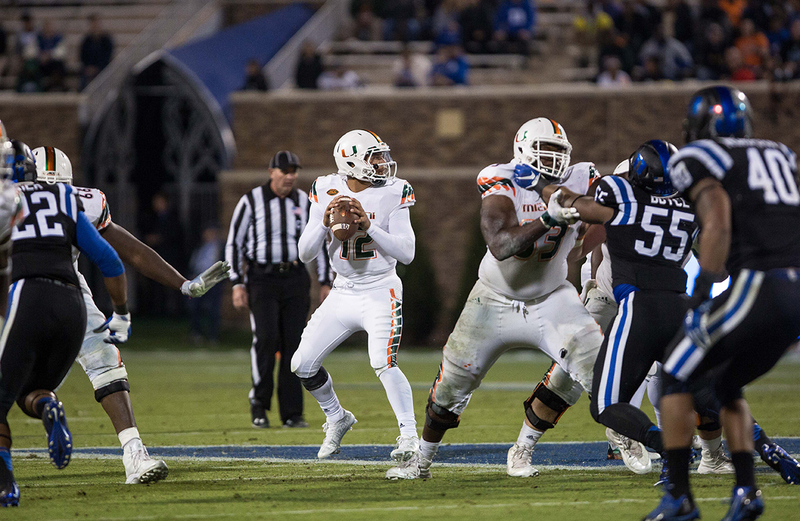 If he doesn’t, the Canes will hope that Malik Rosier is ready to go despite an undisclosed injury that kept him overnight in a Durham hospital after last week’s victory. Both quarterbacks are listed as questionable, but if neither can play against Virginia, redshirt sophomore Vincent Testaverde will get the call. No matter who the Hurricanes have under center Saturday, don’t be surprised to see Miami light up the scoreboard. Virginia has given up 33 points a game so far this season, which ranks them 98th out of 128 teams in the country. With a Miami team that averages 29 points a game including a goose egg against Clemson, it could be a long day for the Virginia defense. The remarkable thing for this Hurricanes team is the fact that through all of the ups and downs, they still have a shot at winning the Coastal. Even if it took a miracle to keep that hope alive, the Hurricanes still have a chance at achieving their main goal for the season. The Canes don’t need a miracle to happen this Saturday. They just need a win.